Observing a musician’s “master class” provides a different perspective than attending a concert or gig, taking a lesson, or watching Ken Burns. A master class is part demonstration, part performance, sometimes part direct instruction―it all depends on the musician and the nature of the audience. As an observer, I’ve attended a few master classes at conferences such as the late IAJE convention. 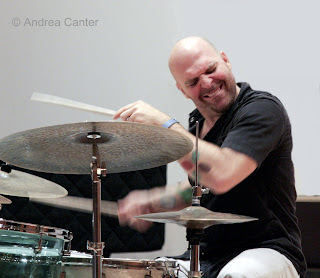 In 2007, drummer Matt Wilson used volunteers to try out some of his ideas for “getting to know your drums.” One exercise involved striking the cymbal with different objects at different points on the metal surface and listening to the way the sound dissipated. It’s difficult to be aware of such aural details in the midst of a quartet or big band gig. I’ve now attended two master classes at MacPhail Center for Music in downtown Minneapolis. Janice Borla presented a master class for voice students (and observers like me!) two years ago, using critiques of student performances as the centerpiece. 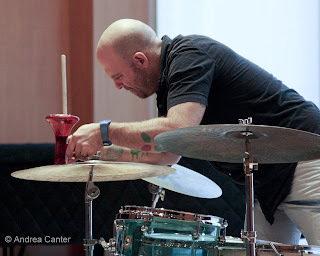 And last Saturday afternoon, I attended what was surely the most entertaining master class of the season, a drum “clinic” presented by local legend Dave King, percussion master for the edgy bands The Bad Plus and Happy Apple. Dave is well known worldwide not only for his powerful and sleight-of-hand technique on the trapset but also for his arsenal of atypical percussion “instruments”—items never intended for musical purposes. Who else uses ET Walkie-Talkies, plastic megaphones, and other children’s toys to evoke a menagerie of sound from otherwise traditional drum heads and cymbals? 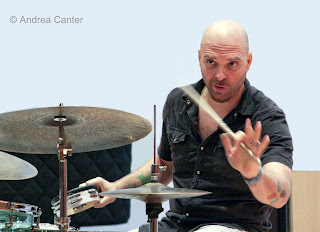 With deadpan delivery and a monologue that could serve as a Saturday Night Live script, Dave talked about a number of elements and strategies in jazz drumming and gamely took on questions from an audience filled with drummers, drum students, and drum fans, some as young as five years old. Throughout the two hours, a common thread in Dave’s commentary was the centrality of the relationship between musician and instrument, and particularly the interactive quality of touch for a percussionist. Just as Matt Wilson had emphasized the nuances in contact between stick and metal, Dave talked about “bringing the cymbals to life yourself rather than relying on technology” and thinking about the gear as a “blank canvass” from which to create. The drummer’s touch—not the sticks, the drumheads, even the ET Walkie Talkies—is what makes each musician unique. “There’s an infinite variety of touching,” notes Dave, and each touch alters the time, the tone, the color of the sound. It’s not a bad approach to life, even for us nonmusicians.